Continuing in the theme begun at our last meeting, this Wednesday will feature another “back to basics” lesson in communication. While last week touched upon the importance of pronunciation, this week we’ll focus on the fundamentals of body language. Join us at this week’s Liberty Village Toastmasters meeting this Wednesday, Feb. 16 at the Harbourfront Community Centre, Assembly Room C. Our Toastmaster for the night, Simon, will emphasize the core communication concept of body language as he talks about the meeting’s theme: “Your Body Speaks – What’s it Saying?”. 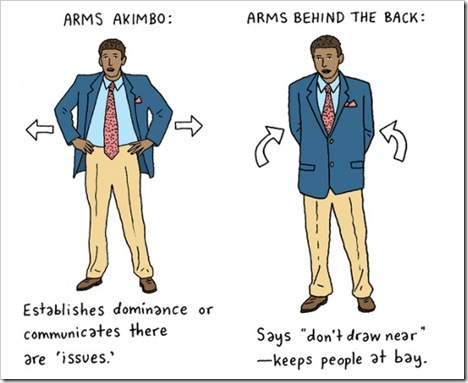 It’s not something we’re all conscious of, but body language plays a vital role in the overall message we convey. We also have a great line-up of speakers for the evening. Keith has been building lots of buzz for his long-awaited second speech, which will finally have its premier on Wednesday night. Hazel will continue her steady progress as a public speaker with her third speech – Get to the Point. Finally, Vivienne will use the power of words to vividly describe “The Trials and Tribulations of a 6-year-old”. Make sure you come out – it’s shaping up to be a great evening.